First car I bought in Miami, in maybe 1978?, was this extremely cute and peppy little, two door hatchback "sport coupe" Honda Z600. It was this same periwinkle purple. When this car was imported it was only Honda's 2nd year selling cars in the US. 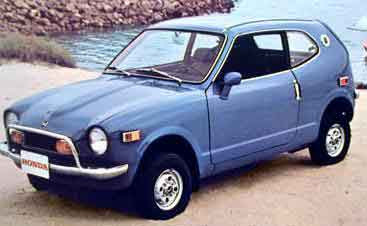 The Civic wasn't introduced until '73. The Z600 was sold at a few Honda motorcycle dealerships, although I bought mine used. It had front wheel drive, and was chain-driven, like a motorcycle. It was powered by a 2 cylinder, 598cc engine (thus the "600" in Z600). I believe it was a 4 speed manual transmission. Strangely enough one of the strongest memories I have, and it's kind of foggy, was driving the Z600 from Miami to somewhere (in Florida?) with Iris I think, to drop me off at a junk yard, where previously the VW van had been towed to, after it had broken down. I was able to make arrangements to buy a used VW transmission to swap out with the blown one on the junkyard premises. I switched the transmissions myself and drove back to Miami in the VW. Can't remember what eventually happened to this purple wonder. When I talked to Iris about this, she told me it was HER car, not mine. We lived in the same house so at least I must have driven it a bit. I remember it being a lot of fun. Similar to the Midget.